Older buildings are the important to our heritage and the built environment. Accordingly, some buildings in the parish are protected with listed building status which limits the activities that can be undertaken to them without permission. Anyone who wants to demolish a listed building, or to alter or extend one in any way that affects its character, must obtain Listed Building Consent from the Local Planning Authority. This is in addition to the normal planning permission process. 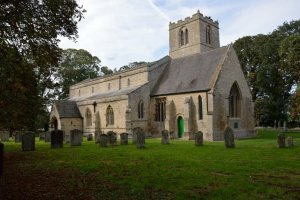 There is 1 grade II* and 5 grade II listed buildings in the parish. Particularly important buildings of more than special interest. Parish Church of St John the Baptist, Caldecott. Mid C13 church with C14 and C17 additions (porch datestone 1635). Restored in 1849. Regular and square coursed limestone with welsh slate and C19 fish scale tile roofs. Buildings of special interest, that warrant every effort being made to preserve them. Duchy Farm, Bidwell Lane, Caldecott. Datestone 1633 farmhouse. Square coursed limestone with slate roof. 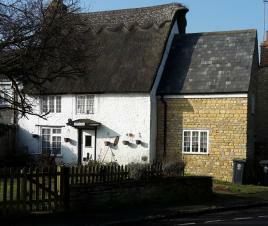 Manor Farm, Bidwell Lane, Caldecott. Early and mid C18 farmhouse. Square coursed limestone with concrete tile roof. Manor Farm Barn, Bidwell Lane, Caldecott. Mid C18 barn. Square coursed limestone with pantile roof. Poplar Farm, Caldecott. Late C17 farmhouse. Square coursed limestone with slate roof. The Cottage, The Green, Chelveston. Early C18 house. Regular coursed limestone and brick with thatch roof. Additionally, part of the Irthlingborough old bridge over the River Nene was within the parish until the parish boundary changes in 1987. This is a grade I structure.